Just opposite yesterday's ruined temple, near the edge of the Liège Nautical Union, you can find this exceedingly arclike sculpture. 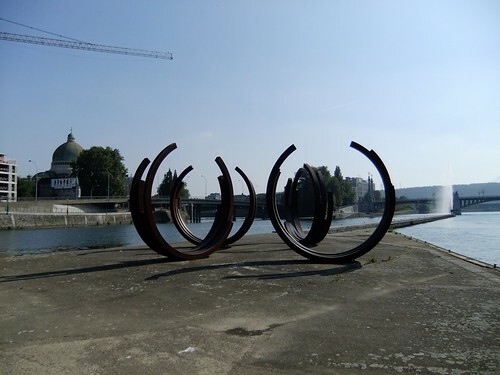 It's by an artist called Bernar Venet and it was probably installed in 2004. 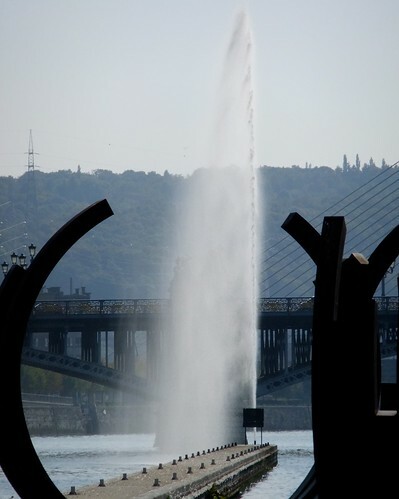 Further out, you can see our water fountain, loosely based on a famous Geneva landmark. I think the steel arcs can be used to frame the water fountain very effectively, on their own they're a bit bland. I particularly like that second shot, Greg. You're right brattcat, the second shot is much more interesting than the first one. I convinced myself that it would be a good idea to reverse the order. So the second shot is now first. Lovely detail in the shot of the arcs framing the fountain. At the tip of one arc there are the lanterns on the bridge, and on the second the diagonal lines. I agree with Brattcat...I think. The shot with the sculptures in the distance is more effective for me in that it puts everything into a clearer perspective. I like the sculptures, although I'm not sure what they mean - maybe something about life being always unfinished and we're striving to close the gaps in our lives?